Every year millions of people visit the Canadian Rockies. While Banff National Park is the most visited national park in Canada you do have other options for hiking in the Rockies. There are plenty of places with less crowded hiking trails, which are great picks when driving from Calgary for a day trip. Whether you’re new to hiking or just want to get outdoors there are some great trails around Canmore. 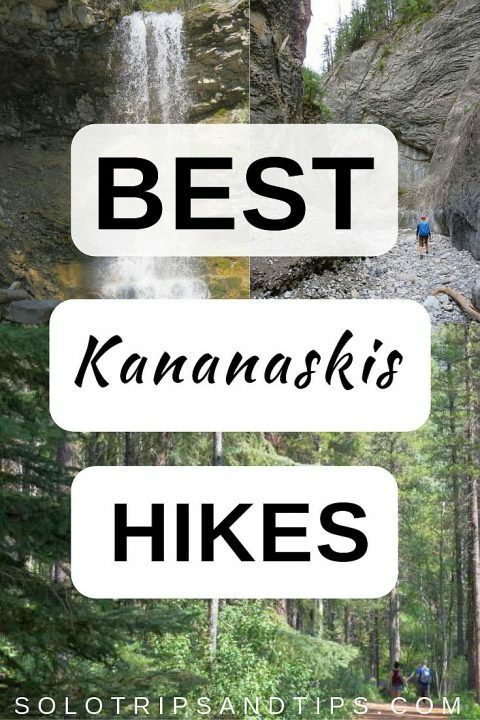 In this post I’ll show you five easy hikes in Kananaskis Country that are perfect day trips from Calgary. Always remember to hike at a comfortable pace for YOU and do not worry if you need to stop and rest. The important thing is to have a good time on your hike. Enjoy getting outside and exploring, stop and look around, listen to the birdsong, and be aware of your surroundings. 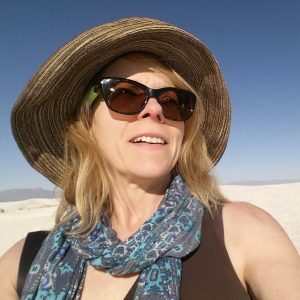 If you have more time you may want to do one of the most scenic drives in the world with great photo ops and hiking options like this foxy looking lake or check out the amazing views of the glacier on this hike. If you drive all the way to Jasper be sure to stop at this amazing place with 5 lakes just before Jasper National Park. 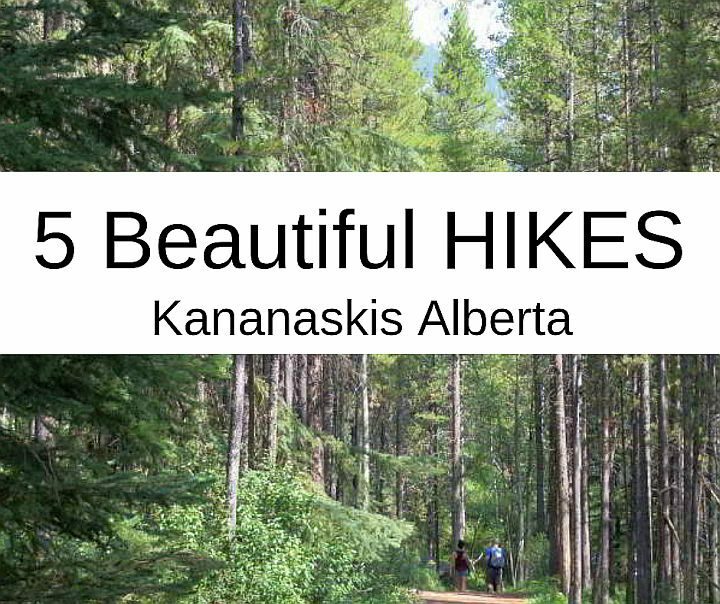 Now let’s check out these five incredibly gorgeous but easy hikes in K-Country. Two stunning turquoise to emerald color lakes. Grassi Lakes is one of the closest hikes to the town of Canmore Alberta and as a result it’s also one of the most popular. Not just because it’s near Canmore but because of the unbelievable color of the two lakes at Grassi trail. 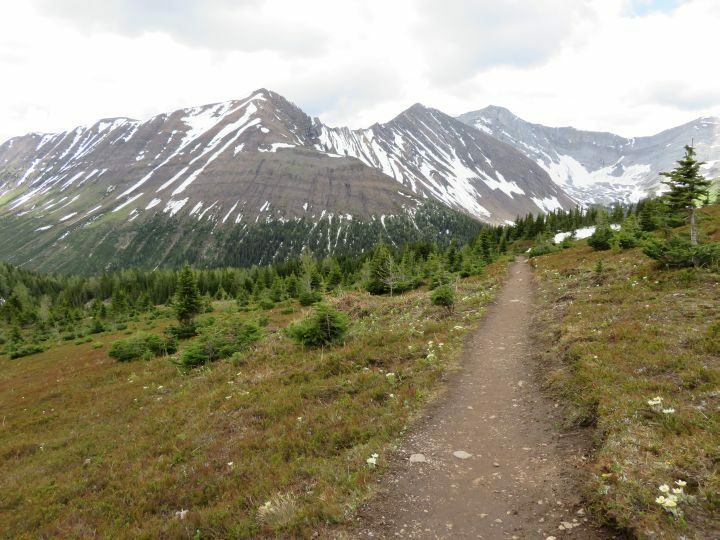 There are two trails at Grassi, both end at the same beautiful lakes, one is easy and one is more difficult. Watch for the sign near the beginning of the trail. 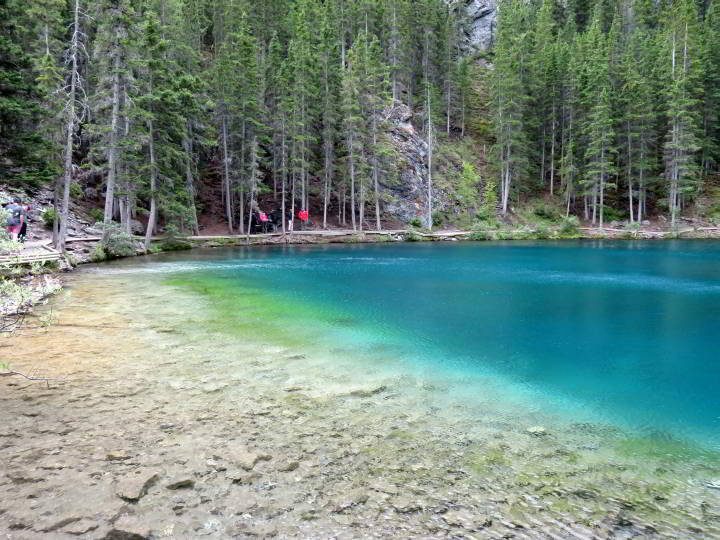 You’ll walk up the gravel road to the Grassi Lakes where you can enjoy a picnic lunch by a stunning aquamarine lake. The other trail is marked as difficult but it’s actually a moderate hike rather than difficult. To find out how the trail got it’s name, directions and more read my Grassi Lakes trail hiking post here. Pictographs along the canyon wall. Another hike close to Canmore and much different than any other hike around Kananaskis area. The Grotto Canyon trail is located behind the plant in Exshaw, if you ever drive on the Trans-Canada from Calgary to Banff you’ll see the plant across Lacs de Arcs. 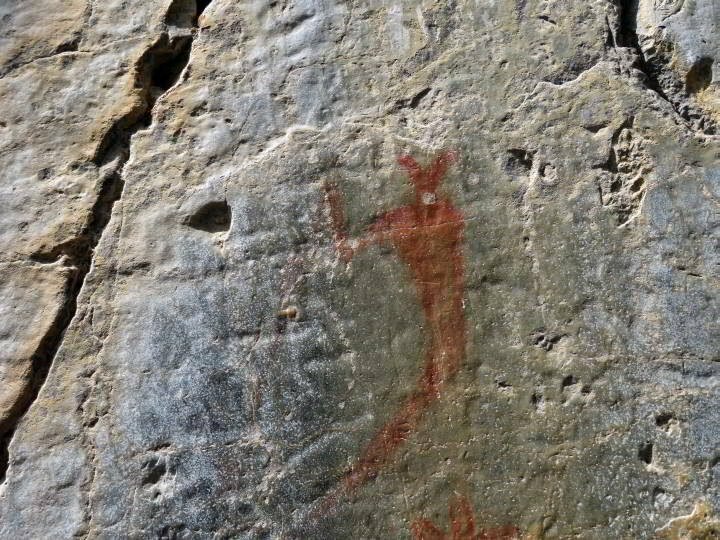 Find out where to see the pictographs at Grotto Canyon here. Family friendly hike with a beautiful waterfall. 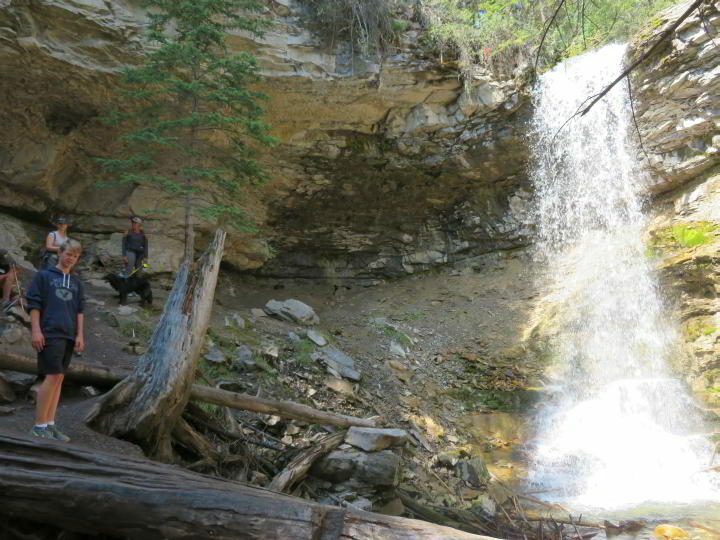 This is a great waterfall hike near Bragg Creek and it’s an easy hike with very little elevation gain. Troll Falls hike is very popular and kids love this trail. It’s especially busy in the summer months but you can also snowshoe or cross-country ski in winter. For directions and more info on hiking Toll Falls trail read my full hiking post here. Panoramic views of the Bow Valley. 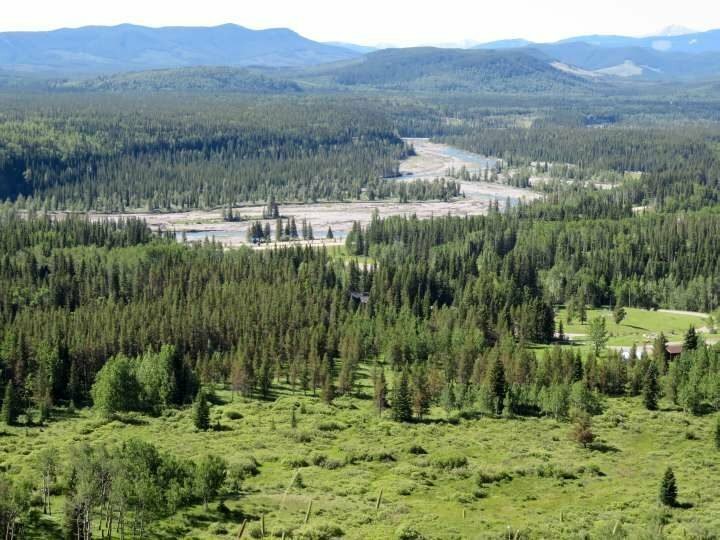 Fullerton Loop is close to Bragg Creek so it’s a nice outing from Calgary if you want to enjoy some time outdoors plus visit Bragg Creek and grab lunch afterwards. You can find more info about hiking Fullerton Loop here. Marmots are common here plus enjoy panoramic views of the Rocky Mountains. 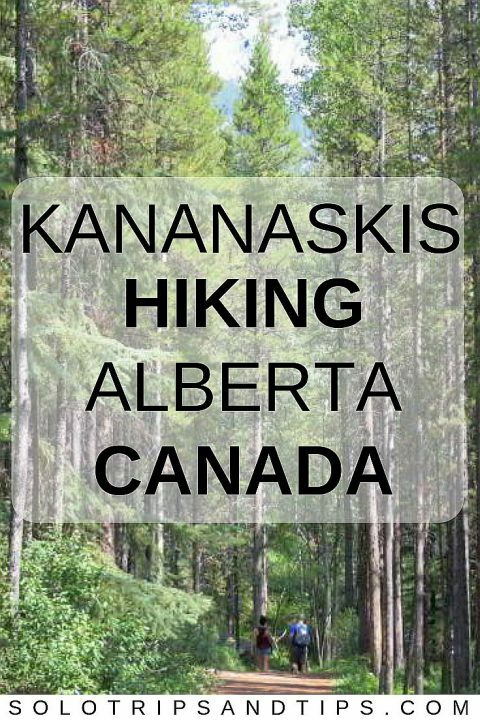 This is one of the best hikes near Calgary. A beautiful trail leads to the cirque, a crescent-shaped basin with steep sides formed by glacial erosion. Put this one on your hiking list for late spring through fall because Highway 40 is closed from December 1 to June 14 each year. See more photos and read about hiking Ptarmigan Cirque trail here. This map shows all five Kananaskis trails. As you can see the two closest Canmore hikes are Grassi Lakes and Grotto Canyon and Troll Falls is the next closest.